When you’re looking for the best place for your next family vacation, you want it to be somewhere memorable. Don’t settle for your typical trip this year; go somewhere special. Have your next family vacation in Ohio! The Hocking Hills offers plenty of opportunities to spend time and reconnect with your family. Learn about all the things to do with kids in the Hocking Hills when you access our free Vacation Guide. Family vacations don’t have to be hectic. You don’t need to run around from place to place. This year, choose to unplug and recharge on a family vacation in Ohio. The Hocking Hills is full of gorgeous greenery and forests as far as the eye can see. This way, you won’t need a vacation from your vacation! Even technology won’t get in the way; our flat screen TVs only play DVDs. The most important part of a family vacation is being together. You’ll have tons of family time during your stay at the Inn & Spa at Cedar Falls! Explore the area to experience all the activities the Hocking Hills holds. Bring a deck of cards for a family game night, cook dinner together in the kitchen of your cabin, or take the kids out for a nice meal at Kindred Spirits. With no distractions to take away from your family vacation, you can finally enjoy some quality time together. Kids are welcome at the Inn & Spa at Cedar Falls! We have cabins of varying sizes, so you can pick the perfect one for your family. Each cabin is nestled in our expansive property amongst the trees. These accommodations are known for being very quiet; it will be like a nature retreat for you and your family. Don’t settle for the usual family vacation. Try something new and visit the Hocking Hills! Give your loved ones experiences they have never had before. Imagine seeing your child on a zip line for the first time or the joy in their eyes when they spot wildlife from your cabin’s porch. When you stay at the Inn & Spa at Cedar Falls, you and your family are sure to make lasting memories. There is something for everyone in the Hocking Hills! Our area is known for its natural beauty and outdoor activities, and kids love exploring. You’d be surprised how many hours they can spend having adventures in the Hocking Hills State Park. It’s easy to plan family-friendly activities, and we are more than happy to help. Read on below for some of our favorite things to do with kids in the Hocking Hills! The kids will be fascinated when you bring them to see the natural rock formations in the Hocking Hills! 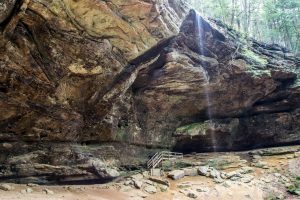 Hocking Hills State Park has many caves you can hike to, and each has an interesting story. Old Man’s Cave derives its name from Richard Rowe, a hermit who once lived in the larger recess cave of the gorge. Ash Cave is the largest recess cave in the state, and a massive pile of ashes left by Native Americans was found there. The hike to Whispering Cave is also kid-approved; it has the first ever swinging bridge in the park! You can have hours of family fun at R Adventure Park! It truly is an adventure park, and it’s just a 15-minute drive from the Inn & Spa at Cedar Falls. Here, you can rent ATVs, play paintball, tackle a ropes course, and visit the Moonshiners’ Mystery Shack. Mini golf is always a great family activity. It’s the perfect chance for dad to show off his putting skills and give the kids golf lessons! Have some laughs as you practice your swing. Our favorite spots to mini golf are Adventure Golf at Rempel’s Grove and the Hocking Hills Market. We can assure you that you and your family have never seen a night sky with stars like this before. In many parts of the United States, light pollution gets in the way of these gorgeous views. Not here! The sky is dotted with thousands of twinkling lights that you can watch for hours. Head to the John Glenn Astronomy Park for the full experience. You can even point out constellations with the 28-inch telescope in the roll-off roof observatory! There are also nightly programs for the entire family to enjoy. If you would like to visit during the day, you can use a special telescope that lets you look at our closest star: the sun. If you’re staying at the Inn & Spa at Cedar Falls in the summer, one of our favorite things to do with kids in the Hocking Hills is tubing down the river! It’s the perfect way to keep cool, and it’s a unique activity you probably are not able to enjoy at home. Rent a tube from one of the many recreation companies, then leisurely float down the river. It usually takes a few hours to make your way down, and you can relax the whole way. Book Your Family Vacation in Ohio Today! Now that you know all the things to do with kids in the Hocking Hills, it’s time to book your stay. Kids are welcome in our cabins, and there’s more than enough room for the whole family! You’ll love spending family time on the porch swing or watching a movie together in the living room. Plus, our cabins come with kitchens so you can have family meals without worrying about going from restaurant to restaurant. 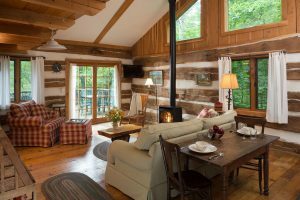 Set back on our expansive property, our cabins provide a nature retreat for you and your family. Book your getaway today!